Chef Will Gordon grew up on San Juan Island. From twelve years of age on, summers were spent working in restaurants as a dishwasher and pantry cook. 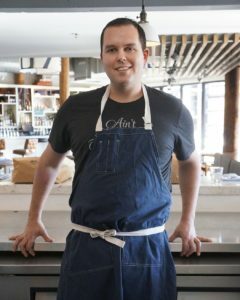 After graduating from Rice University in 2005, Will fell back into the restaurant lifestyle cooking first on San Juan Island, before moving to Seattle to make his fortune. Will started working for Tom Douglas Restaurant Group (Etta’s), but in many ways, the opportunity to work for Jason Wilson at Crush was really the start of his serious cooking career. From there he worked for Mark Fuller at Spring Hill before moving to San Francisco to broaden his culinary horizons. In San Francisco Will spent a couple years working for renowned chefs Chris Cosentino (Incanto) and Gary Danko (Restaurant Gary Danko). He came home to Seattle and took a job with Ethan Stowell Restaurants, eventually becoming the Sous Chef at How to Cook a Wolf. From there he moved onto Westward, which has been a wonderful opportunity for him. Stylistically, he tries to keep things pretty simple and focused. He likes food with enough different flavors and texture to keep a large plate interesting. They base the food at Westward on the Mediterranean flavors and diet, but try to spin it out and make it a little weird from there. In his free time, Will is usually watching basketball and dreaming of or acquiring Nachos. Consequently, he likes to run as well.